Maria Montessori was an Italian physician, educator, and innovator internationally acclaimed for her educational method that builds on the way children naturally learn. She was one of the first Italian women to receive a medical degree, and had her first appointment at a psychiatric clinic, where she worked with disabled children. Dr. Montessori became convinced that educating children was as much about the teaching method as in the medical treatment. She later developed her own educational materials and philosophy to aid children of all abilities in their understanding of the world. After several years of teaching and observing, Dr. Montessori refined her techniques and opened the first Montessori school – the Casa dei Bambini (the Children’s House) – in Rome in 1907. There she created a classroom modeled as the “prepared environment”, with child-sized chairs and tables, low shelves for all materials to be available to the children, supplies for children to clean up after themselves, and much more. The classroom was created to foster a joy of learning and creative exploration. Teachers, also known as guides, were encouraged to “follow the child” – that is, to let the children’s natural interests take the lead – and then present the materials and encouragement for children to make their own self discoveries. Through individual freedom to explore, children gain a sense of responsibility and a love of learning, as well as a compassionate acceptance of one another. Throughout her career, Dr. Montessori traveled the world, lecturing to educators, and writing extensively about her approach to education. There are now more than 22,000 Montessori schools in at least 110 countries worldwide. The prepared environment is the cornerstone of the primary Montessori classroom. It promotes independent learning and the freedom for children to explore. In the prepared environment everything the child needs is accessible to them (e.g. low shelving where children can gather their own learning tools). 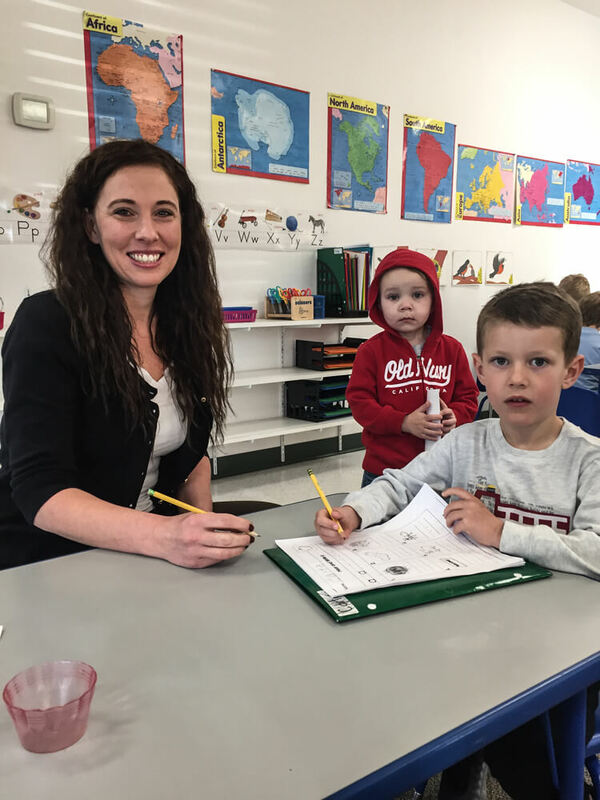 The children work freely, alongside – and with – each other, while teachers work one-on-one, or with small groups, introducing students to new materials and new concepts as they each become ready. Once introduced to a skill, the activity is accessible for the child to self-select later and then repeats the lesson for skill mastery. Some pieces of the Montessori equipment isolate one skill and focus on it, while other pieces may be educating the child in multiple ways. Many of the materials are self-correcting, which also promotes independence, and problem solving. The Montessori materials build upon one another, making the progression important. Many pieces of work generate no paperwork so children are busy working throughout the day, yet without take-home papers demonstrating their achievements. To new children visiting the school, teachers – or fellow students – can showcase the materials. 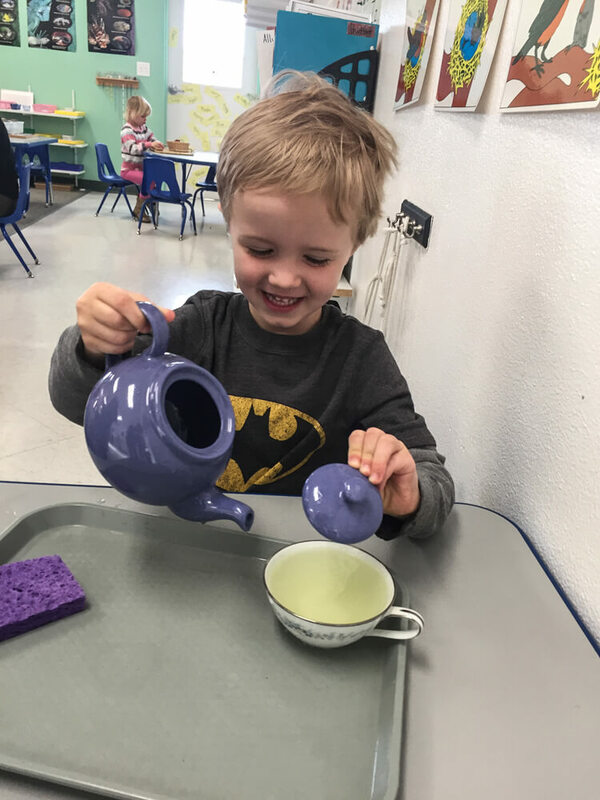 Beyond the classroom, children use the Montessori Gardens to discover the joys of growing plants including starting seeds indoors, transplanting seedlings, and then tending to their flowers and vegetables throughout the growing season. As the produce matures, the children harvest their crops and enjoy nutritious snacks in school; thus providing a complete experience of bringing fresh produce to the table!